As the restless summer sun rises over the Kazakh steppe, hundreds of inhabitants of the Baikonur Cosmodrome squeeze into crowded railway car compartments which will carry them from their town on the shore of the Syr Darya River to the launch sites scattered across this barren landscape. Since 1955, when a secret missile test range was founded here, such trips have become a routine for generations of officers and civilian workers. According to Ivanchenko, the first Baikonur trains were equipped with 1930s-vintage cars with wooden bunk beds, windows usually stuck in the open or closed position and out-of-order toilets. Although more comfortable cars slowly replaced the old ones, "the tradition of closed toilets and lack of water remained unshaken." In the summer, the trains waiting for their passengers for a return trip under open sun, would turn into a "Finish sauna." To survive the rides in overheated compartments, the officers would undress down to their waists. Not surprisingly, women, who comprised a significant percent of Baikonur's workforce, were assigned separate cars. Only between the end of the 1970s and the beginning of the 1980s, were special shelters protecting the trains from the heat during idle time built at the end stations and air-conditioned cars introduced. Better, bigger cars immediately brought their own problems, as few of the conscript soldiers tending the cars could maintain the complex air-conditioning and electrical hardware onboard. As a result, some experienced officers from the spacecraft test units "volunteered" to double as cooling system repairmen and electricians. All these improvements did not save the trains and their riders from brutal snow storms in the winter. In his memoirs, Ivanchenko describes how personnel of the launch complexes would get stranded at their work places for the night by raging weather. Even worse, the "buran" (snowstorm) would sometimes catch up with the train somewhere halfway between the work place and the town, trapping its passengers in the middle of a snowy desert. Apparently, sometimes in the 1980s, the Soviet government, fed up with the problems of transporting thousands of people dozens of kilometers across an inhospitable desert, devised plans to move some of "labor-intensive" activities in the vicinity of the residential area. The original reason for the construction of the launch complexes far away from the main railroad and from each other had been secrecy and safety in handling nuclear warheads, as well as survivability of the facilities in case of a nuclear attack. However, by 1983, the last nuclear-tipped missiles left Baikonur, while the true location of the center was no longer a secret not only to foreign intelligence services, but also to any interested observer. The construction of brand-new processing facilities started at the edge of the town, however, as the space program took a back seat among government's economic priorities, the project turned into a "dolgostroi" -- a Russian term for never-ending construction. 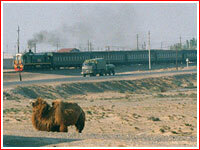 Alongside of Baikonur's main rail line, an uneven automobile road dulls across the steppe. 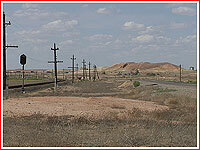 Apparently, due to the secrecy, which once surrounded Baikonur, the road from the town to the test range never had distance markers. Instead it was informally measured by its natural elevations. To identify a location on the road, one would say something like: "The oxygen plant is at the third elevation." Several sources date the foundation of this road to June 17, 1955. At the time, construction activities at the first launch complex in Tyuratam went in full swing, and access to Site 2 suddenly became a stumbling block. Due to a lack of special concrete rings, workers had to leave six-meter gaps in places where pavement of the road was expected to go over water lines. However, heavy MAZ trucks had already started using the incomplete road to deliver their cargo to the launch complex. Upon approaching the gaps, some drivers accelerated their vehicles until they jumped over the gaps, often damaging the suspension of their vehicles. The chief of the range construction, Shubnikov, horrified by the scenes of "flying trucks" directed the manager of the brigade responsible for the work, to complete the road as soon as possible. Decades later, the road to the cosmodrome starts at the gated entrance into the town of Leninsk, now renamed Baikonur, passing the village of Tyuratam; the road then dives under the overpasses of the Western-Kazakhstan railroad and the M-32 highway. For next several hundreds meters, the road runs across "no-man's" land -- essentially unrestricted space, which after 1995 was considered Kazakh territory. However, accidental travelers are inevitably stopped at the check point building, whose front wall is embellished with a stylized sculpture of a star with the image of the cosmonaut helmet in the middle and the proud words "Road to the Stars." The Russian flag tops the roof of the checkpoint manned by soldiers. According to the guides, most of these soldiers serve in the Russian army under contract, as oppose to regular conscripts. Beyond the checkpoint, the road sweeps across the mainly empty, but nevertheless closed to outsiders territory of the NIIP-5 test range, better known as the Baikonur Cosmodrome. The first feature a traveller sees from the "Road to the Stars" are the towers of the command and control network, or KIK. The large dishes of the antennas of the Saturn tracking station dominate the landscape to the east from the road, while enormous fortress-like towers of the Vega trajectory measurement system stand to the west. The road then passes a hill, known as "sopka" (rock), and the sprawling industrial landscape of the propellant-producing plant. Several kilometers later, a careful observer will also notice a number of straight-line concrete roads, disappearing beyond the horizon, heading toward old missile silos and command bunkers. 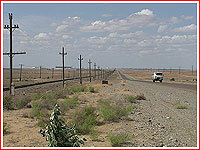 Some 20 kilometers into the steppe, both the road and the rail line running besides it, reach two major junctions -- first a road branching out to the east, toward the "left flank" of the cosmodrome with launch complexes for the Soyuz, Zenit and R-36M rockets and another road turns to the west, toward so-called Proton city. The main road continues north until it reaches the sign "Baikonur," at the edge of the Site 2 -- the original launch complex of the cosmodrome.